One off property! 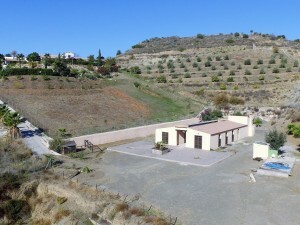 This property is a fantastic opportunity, the main villa has 4 bedrooms, the guest annexe has two bedrooms, heated 10x5m pool, garages, its very own crazy gold course and amazing views! 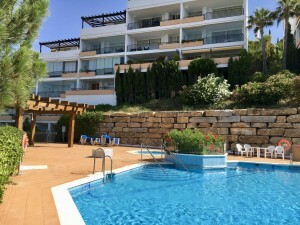 Located just a few minutes drive from the village of Partaloa and 10 minutes from the larger market town of Albox where you can find all amenities. The access is via a tarmac road and the drive way is private for two properties. The whole plot is fenced and gated. The main property has a large fly free games room/extra lounge & dining area at the front with fantastic far reaching views over the surrounding countryside and pool. From here the front door opens into an L-shaped hallway. An open doorway leads into a spacious fitted kitchen /diner with ceiling fan. A door from the kitchen leads into a small lounge with patio doors leading out to the pool area - this room would make an ideal dining room. Back into the hall and to the right double doors lead into the lounge which benefits from air conditioning and double doors out to a glazed conservatory. The hall separates all the bedrooms from the living areas. First of all is the master bedroom which benefits from fitted wardrobes and an en suite shower room. The hall also gives access to three further double bedrooms with fitted wardrobes and a separate shower room with large shower. The lounges and all bedrooms benefit from air conditioning and ceiling fans. The guest annexe and comprises a private conservatory, fitted kitchen, lounge with fire place, two bedrooms and a bathroom. Next to the annexe is a building housing a kitchen, storage room, utility room and log store. Outside, there are so many areas to enjoy! 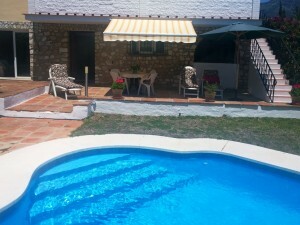 The swimming pool is surrounded by a large tiled patio. To one side of the pool is a fabulous bar area & games room with wooden decked floor and log burner for when it gets chilly, next on from the bar is a lovely Jacuzzi room with a 6 seated Jacuzzi! There is also an outside WC /changing room. From the pool area a door from leads into a large room which adjoins the main villa and is currently used as a gym / games room. There is so much space! There are many extras, the main house benefits from solar hot water with a backup gas boiler and has a mains fed 3000 litre water deposit along with a water softener. The guest annexe has a gas boiler along with a mains fed 6000 litre water deposit and also benefits from a water softener. There are also two garages! A one off property definitely worth adding to your viewing list!